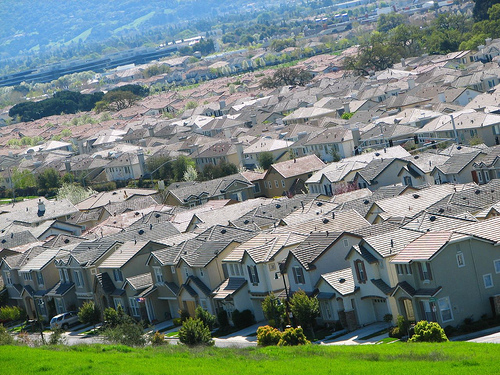 Suburban sprawls California style. Photo by pbo31. In September, California Governor Arnold Schwarzenegger signed into law a piece of ground breaking legislation promoting transit oriented development in the state. The Bil, SB 375, focuses on reducing green house gas emissions by changing land use patterns. While cities like San Francisco offer dense, walkable communities to their residents, many Californians live in sprawling suburbs where cars are essential for accomplishing the most basic task outside the home. Although it remains to be seen how the legislation will be implemented, the bill has been designed to provide incentives to developers that build along transit lines. View the Governor’s press release here.